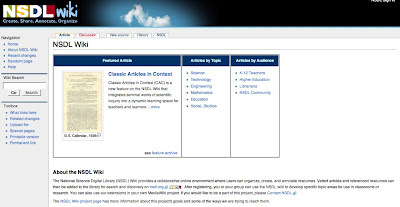 HighTouch: Is knowing Mediawiki an essential skill for academics? Is knowing Mediawiki an essential skill for academics? While reading my feeds this morning I have already encountered three MediaWiki installs. Two of the three were sites where software documentation was maintained. The last, was the National Science Digital Library (NSDL) which is funded by the National Science Foundation. The purpose of the NSDL wiki is to provide resources that support learning innovation in science, technology, engineering, and mathematics education. The site maintains a digital repository of high quality materials for use in classrooms and research for K-12, higher education, and libraries. It is a very impressive effort. This is yet another example of MediaWiki being used to foster the work of scientific communities. You see it being used everywhere. (What do these medical wikis have in common?) I'm starting to wonder how you can be a scientist, engineer, physician, or teacher without having basic MediaWiki skills? If you don't know how it works you have effectively removed yourself from the conversation. The network effect around MediaWiki is so strong that it can't be ignored.